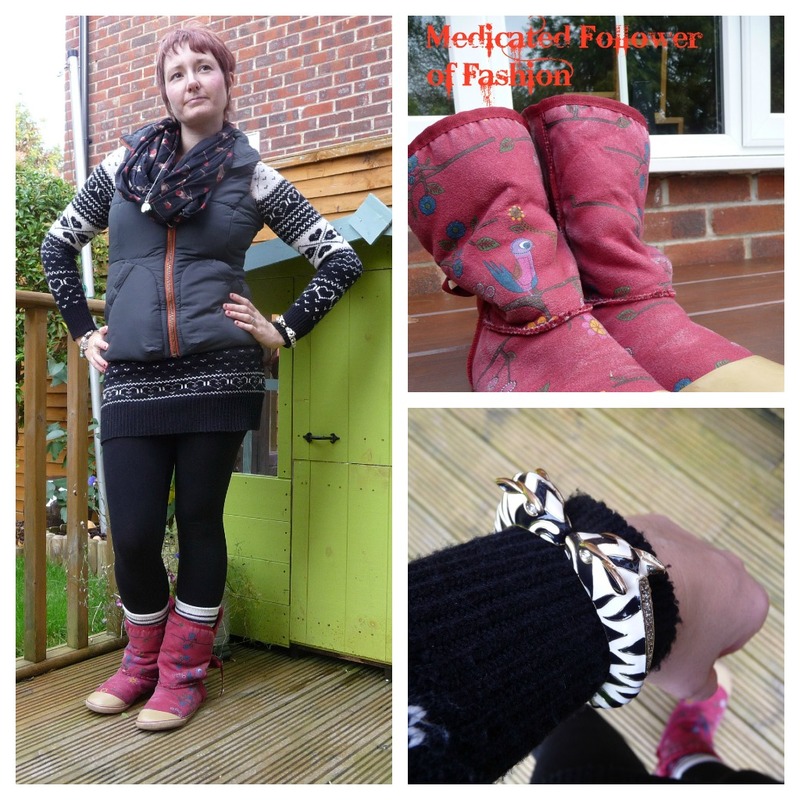 Medicated Follower of Fashion: Getting back into the swing of things..
Blogging has really taken a back seat over the last few weeks. Obviously I took a planned break when we were at Centerparcs, but when we got back, I was ill and this week Ethan has been ill.. with all that illness and a few other things thrown into the mix, I'm afraid I've been very slack and have been neglecting my blog.. even my emails are going a bit crazy. I'm trying to get back into things now. This jumper dress is an Autumn/Winter staple of mine. Very cosy and snug, it also has a gorgeous Nordic style pattern which I love. I'm afraid you can't really make out the pattern on my socks, but it's very similar, just different colours! I found this snood in Primark at the weekend. I was queueing up to buy a few pairs of PJs I'd spotted for Ethan when I noticed this had been dumped by someone else. It cried out to me "Pick me up! Take me home with you!" 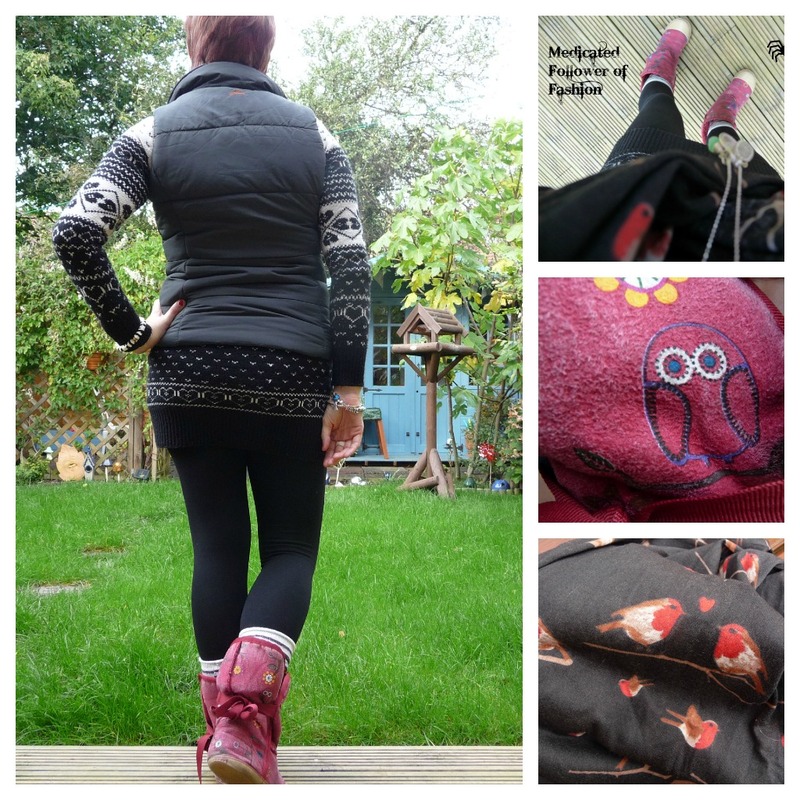 As I had robins around my neck, I thought I'd bring out my birdy/owl boots. These boots have been with me for years now. They are a little tired, but I love them. The print has to be one of my favourites EVER. Just soooooo cute! Can you spot my Stella & Dot bling? I recently invested in a Kalahari Bangle which comprises of two zebras. I like to think they are kissing!! Love it. Linking up with all the usual suspects today, Transatlantic Blonde & Pleated Poppy. Hopefully this is me getting back to my usual blogging form now... fingers crossed! I love that sweater! I've been looking for heart patterned knits for 2 years!